They didn't stay long and on constant move! I take it, as it was a happy sight to see. 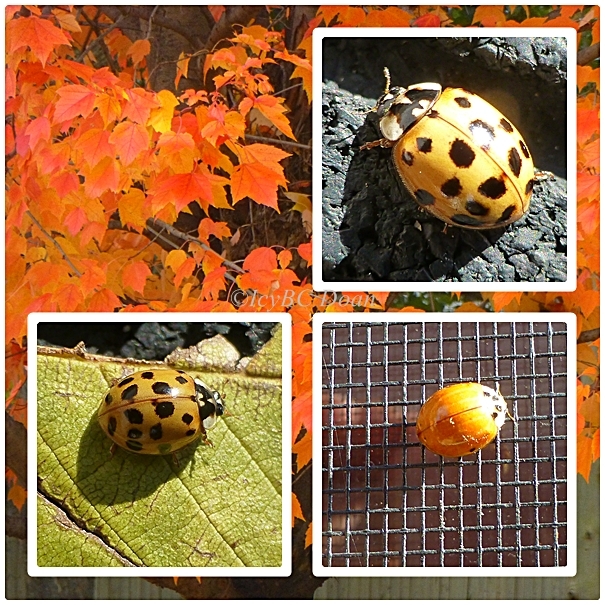 With our weather getting so cold, seeing lady bugs was a huge joy. Happy weekend to all.. Happy weekend to you, happy weekend to the lady bugs. And happy weekend to me. I am going to take part in a half-marathon Penang Bridge run this Sunday, on 3:00am. Looks like Asian Lady Beetles -- we usually get swarmed by them in mid Fall on a warm day, but it didn't happen this year. Yay! Cute little "girl." what a beautiful shot! love november ladies! Cute ladybugs and a pretty mosaic! Happy weekend to you! Lovely photos of lady bugs and a wonderful quote. If we only take the time to see the heavenly places on earth, we will be able to understand what a wonderful world in which we live in.There is beauty in everything in this world and we can see this beauty only if our heart and mind is open. Best wishes. They didn't stay long because the had to "fly away home." They are beautiful and you took some great photos of them.